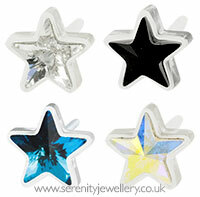 Hypoallergenic Blomdahl medical plastic stud earrings with 5mm star shape Swarovski crystals in 6mm settings. These earrings come with medical plastic butterfly backs. I bought these earrings for my daughter after realising that she was allergic to 'metal'. They are really pretty and she says they feel so light and comfortable. 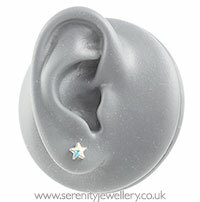 I would highlr recommend these earrings to people who don't have allergies too. 2nd time purchase. Excellent earrings and service. My daughter really fancied the earrings. No allergies! My daughter was delighted with these earrings. Nice and sparkly and very comfortable. Having recently become allergic to other earrings she is very happy to be able to wear these.